It was qualifying day today! 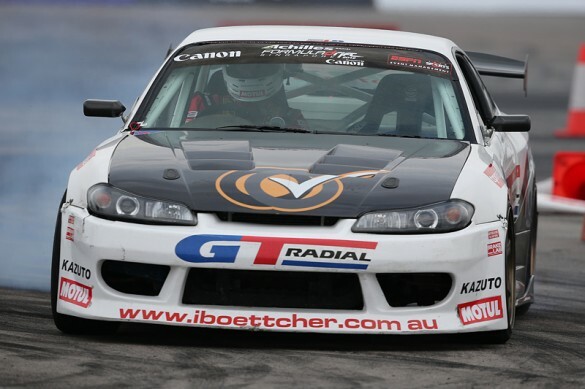 We arrived at the track nice and early on the GT Radial team bus and finished final preparation for the day ahead. Today’s plan was simple; get comfortable on the track and put down 2 solid runs to get ourselves as high up the order as possible. We were in the second group for practice so while the first group took to the track I watched on to pick up as much info as I could before I took to the track. When it was our turn to head out, we made sure everything was in order and lined up. I worked on my line and by the end of the session I was happy with my runs and knew what I had to do in those 2 very important runs later in the afternoon. When we came in from practice it was time for an autograph session with my great sponsors and friends at the Motul booth! They had prepared a really cool poster of myself and Daigo Saito for us to sign. Once I took a seat at the stand and began signing a was really excited to see the line growing! And after spending a while in the seat on my own Daigo arrived and we signed the posters together. 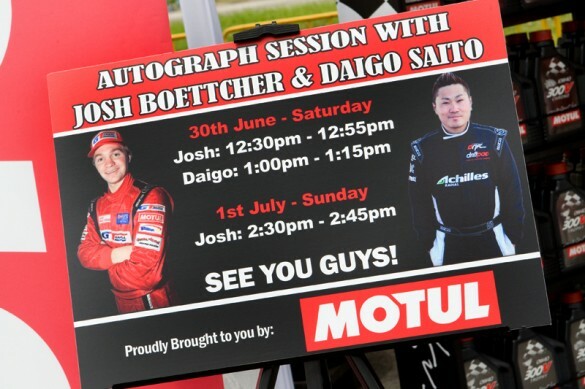 It was really exciting to be sitting with such a huge name in the sport and signing autographs with him on our Motul team poster was really cool. We then headed for the all driver autograph session which was once again a great turn out, it’s awesome to be part of such a huge event that draws such an enthusiastic and involved crowd! So next up was qualifying. I was feeling confident I could qualify well and was looking forward to the first run. I took off and everything was feeling good. I made a few small corrections as I hit full lock through the outer zone, but ran a good line. Alison radioed through the score, it was 75 (my wife Alison is my spotter for this weekend!). But as the reading for the 10 speed points was being monitored through the outer section, due to those small corrections I missed the required speed and therefore the 10 points it offered. So over all a good run, but I just needed to the speed points! Check out the run below! The second run I wanted to push a little harder. So as I transitioned from the first inner clipping point to the outer zone I wound on too much angle and ended up taking a shallow line. The score this time wasn’t as good so the first score would count. The day wasn’t over though. We had some wild driving to do in the ‘Nation’s Cup’! Daynom and I set out a plan and took to the track with entertainment in mind. But after a completing 2 runs with various tandem donuts and generally loose driving found out they really just wanted some crazy driving but with a few less donuts! 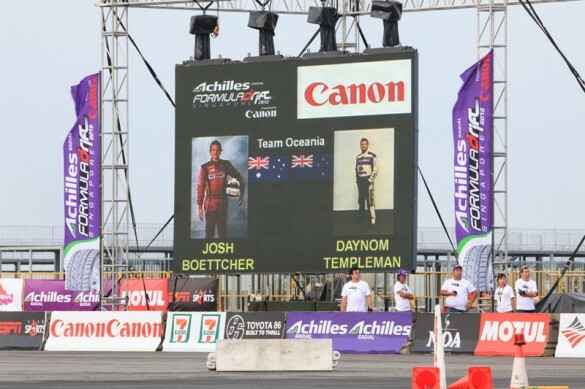 Oh well, we tried to entertain, but the win went to team USA with their overtaking manoeuvre during the tandem run! 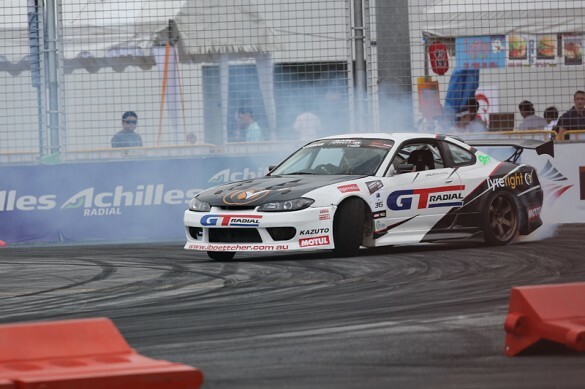 Well done to Ken Gushi and Robbie Nishida! Check out the video below from our Nations Cup run! So now it was time to find out our official qualifying position at the drivers briefing. ‘The Voice of Drift’ Jared DeAnda read out our positions. 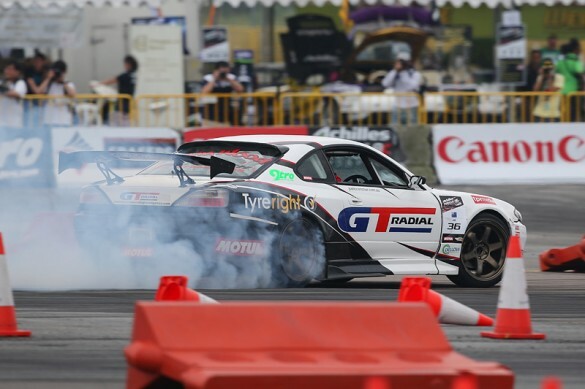 I ended up qualifying 13th and will be facing Falken Tire driver Kevin Rajoo in the top 32! So tomorrow is the big show, the top 32 finals. So keep an eye on my site, and if we can we will keep you updated as much as possible throughout the event!